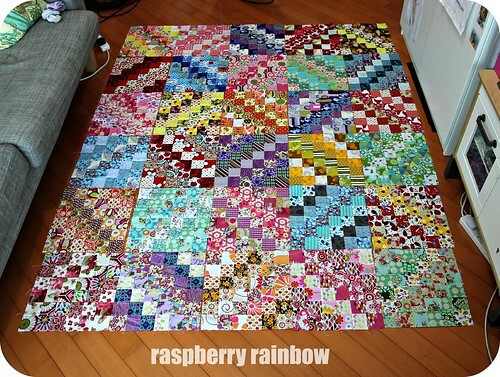 Raspberry Rainbow: Let's take a scrappy trip, shall we? Let's take a scrappy trip, shall we? My Grandmother's quilt should not have been my first. 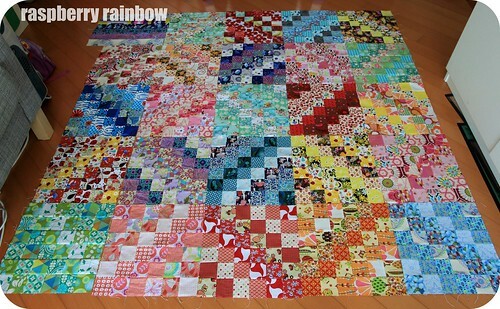 I had actually started another quilt before I made hers - this one I am going to show you now. Back in late December of last year, I noticed on Instagram that a quilt-along was happening, called the Scrappy Trip Along. The blocks for the quilt looked so interesting, I was fascinated how they were made and I so desperately wanted to make a quilt of my own. I knew that I would soon be trying one of these blocks. Of course, I loved making my first blocks, but I was not happy with using random fabrics. Maybe the control freak in me did not like the randomness. I wanted more control. I chose to have each block as a colour theme. Six different fabrics of the same colour together in each block, kind of like a rainbow. I do like rainbows! By the end of January, I had 24 finished blocks. All fabrics used had come from my stash. I was in love. To be honest though, I had no idea where I was heading with this quilt. I laid out all my blocks together, seen in the photo below, and I knew it needed to be bigger, a few more yellow and orange blocks too. I took a break from my Rainbow quilt to make Grandma's. I was itching to add more blocks, but I had the deadline of Grandmas 90th birthday party. I had to finish that quilt before her party. Finally by the end of May, I had 30 completed blocks. As I was laying them out with much excitement, I believed I had finished all my blocks. Once they were all together though, I knew immediately I had to make 5 more. If this quilt was to be the one we snuggled under on our couch, it had to be longer. So 5 more blocks were made. I have yet to take a photo of all completed 35 blocks, it is getting more and more difficult to photograph as this quilt is so large and our living area very small. I have created a board on Pinterest with all this info together, you can see that here. 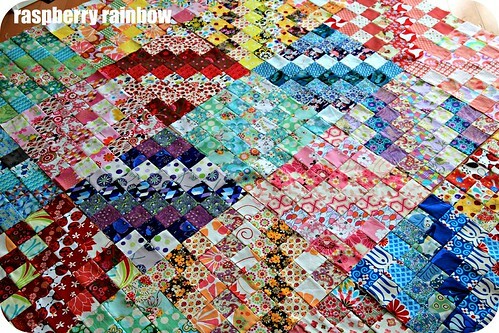 There is also a Flickr group with so many photos of gorgeous scrappy trip along blocks and completed quilts. Go check it out of you want some inspiration. 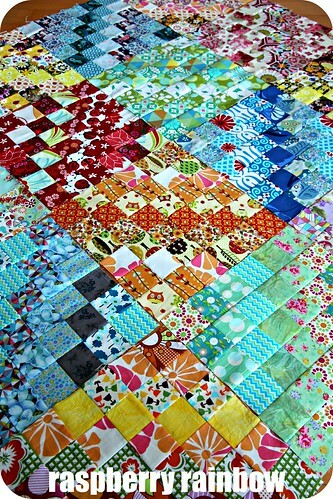 I am so eager to finish this quilt, but a secret project has been taking up my time, I'll share that as soon as I can. 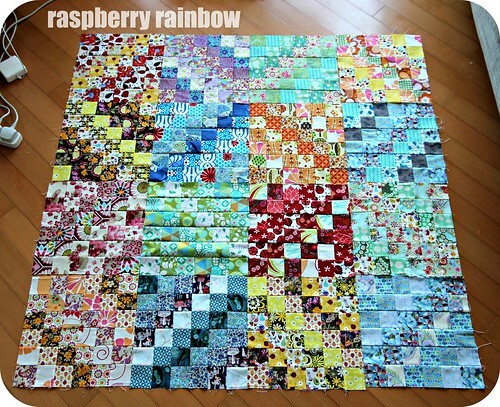 Do you want to make a scrappy trip along quilt, or have you already made one? Your new quilt is gorgeous. I really adore the light/dark values and the pretty rainbow you've ended up with. Such a stunning quilt. I'm inspired. I love this. So beautiful! All stitched up with love.